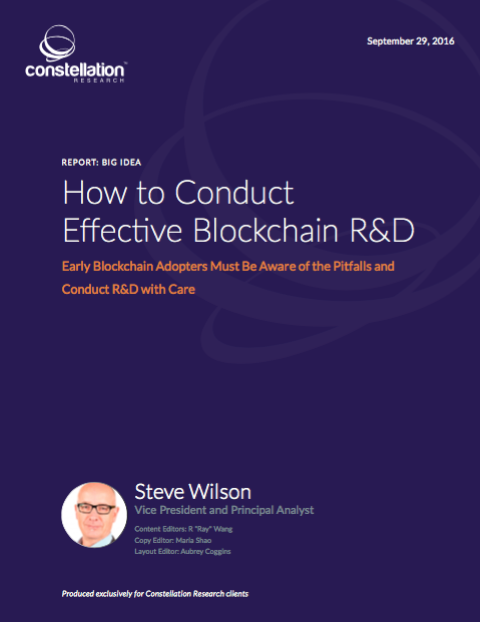 How to Conduct Effective Blockchain R&D | Constellation Research Inc. This report explains how to ensure blockchain research and development (R&D) produces secure and effective Distributed Ledger Technologies (DLTs). A previous Constellation Research report, Beyond the Hype: Understanding the Weak Links in the Blockchain, described how this technology is inspiring fundamentally new R&D (in parallel with the more attention-grabbing yet questionable applications).1 In this new report, Constellation aims to provide a framework for more sustainable research and development of DLTs. These technologies were expressly designed for purely digital assets and require significant modification for physical asset applications. For organizations looking to deploy DLTs, Constellation’s framework involves careful consideration of the nature of their assets, the need for off- chain processes to map relevant physical assets onto the blockchain, and the role of administrators. This report concludes with three case studies examining how the Linux Foundation Hyperledger Project, Ping Identity, and R3 conduct effective R&D in advanced blockchain-related technologies, each in their own way, solving real problems and investing in DLTs effectively.